HRC is proud to have joined advocates from FreeState Justice to advocate for two important pieces of proposed legislation that seek to protect LGBTQ youth across Maryland. 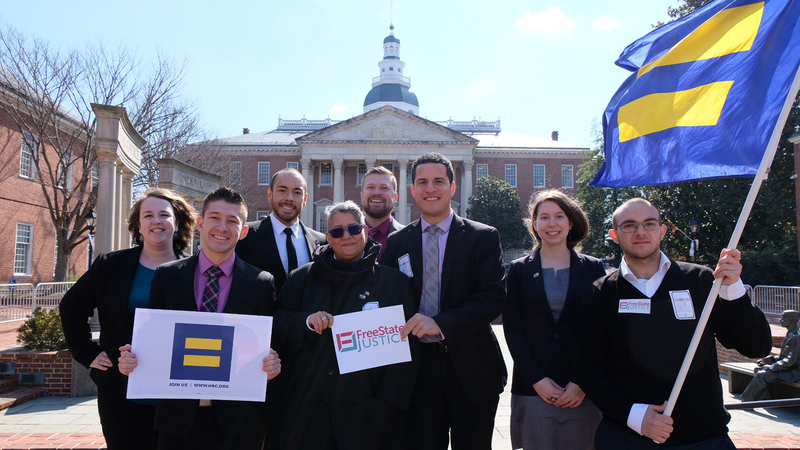 FreeState Justice brought together LGBTQ advocates from across Maryland to lobby in Annapolis in support of the Youth Mental Health Protection Act and the Ending Youth Homelessness Act of 2018. The Youth Mental Health Protection Act (HB 902 / SB 1028) would establish important safeguards to protect LGBTQ youth from the dangerous and discredited practice of so-called “conversion therapy.” Both chambers of the Maryland legislature continue to consider this critical legislation. Earlier this month, HRC legislative counsel Xavier Persad joined mental health experts, legislative sponsors and advocates from Free State Justice, the ACLU of Maryland and numerous medical and mental health organizations to testify in support of both bills. The Ending Youth Homelessness Act of 2018 (HB 1224 / SB 1218) seeks to establish a grant program to support homeless youth, addressing the overrepresentation of LGBTQ youth and youth of color experiencing homelessness. Approximately 40 percent of all homeless youth identify as LGBTQ. Find out how you can get involved with HRC to support LGBTQ youth in Maryland by clicking here.